The news of Pakistan’s women team beating the 3rd ranked New Zealand for the first time is still fresh and Bismah XI have set yet another record in the ongoing 2nd T20I at Sharjah. Batting first, New Zealand has set Pakistan a target of 151 in their allotted 20 overs, however, the visiting team’s innings was nothing short of theatrical. 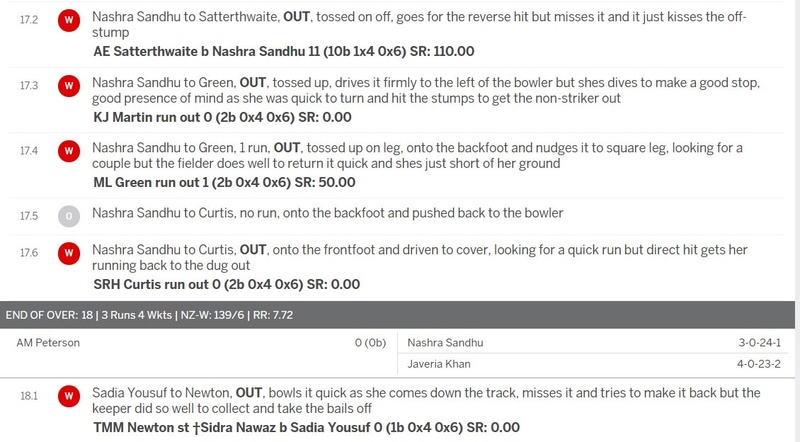 In a dramatic turn of events, Pakistan took 5 wickets in 6 balls to restrict NZ to 151/8. Sitting pretty at 131/2 in 16 overs, New Zealand was all set to post a huge total on the board. But, then Pakistan did what they do best; took one wicket in 17th, 4 in 18th and another in 19th to relieve their batsmen somewhat. Six of these wickets came in successive balls, debutant Nashra Sandhu’s over yielded 4 wickets off 5 balls, while Saadia Yusuf took another off the first ball of the 19th over. 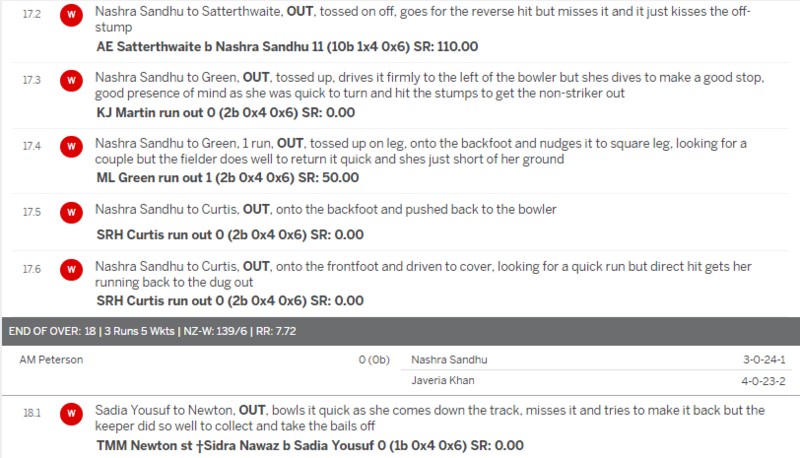 It may well be a new record in women’s T20I cricket that a team has taken 5 wickets in 6 balls. Amazing thing is that 4 out of these 6 were run-outs; something Pakistan team is not known for. The openers blasted the Pakistani bowlers all around the park with Sophie Devine scoring a blistering 70 off 44 balls which included 5 sixes, while the captain Suzie Bates also took the charge to the bowlers hammering 52 off 43 balls. It all fell apart once the openers departed, giving Pakistan the chance to get back in the game. The match can be watched live on YouTube. Update: There was a mistake in the scorecard which stated that the same batsman was out twice. The issue has now been rectified and Pakistan team took 4 wickets in the 18th over. Pakistan lost the match by 39 runs as the team only managed 111/7 after 20 overs of play. HO HO HO HO’S all around. Lets See : My Interview will be published may be this week ! Say you love me. Are you single? Hmmmm. I think we should hang out sometime. After the interview is published. Why not? I love you. So. huh.. print screen tu sahi se kar lo :-( Those are actually 5 wickets in 6 balls, screenshot attached. Anyone can double check from cricinfo scoreboard too. Hey techjuice shut the fu** up.